In a recent lecture, N.S. Vishwanathan, Deputy Governor of the Reserve Bank of India which talked about the famous circular: The Revised Framework for Resolution of Stressed Assets RBI circular of 12th February 2018 and the Insolvency and Bankruptcy Code, 2016. There has been a demand that some corporates want to pay but can’t. Should we treat such cases differently than a wilful defaulter, or simply someone who can’t? Like, bankers want to not call the “want to pay but cannot” kind of defaulters as NOT NPA. That isn’t right, says Vishwanathan. In the speech, Vishwanathan provided the matrix below. 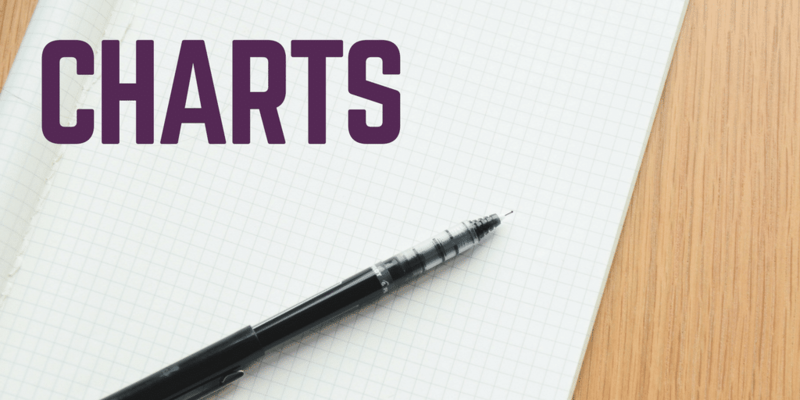 In the banking framework, if you’re willing to pay but can’t – then you get some kind of ad-hoc funding or restructuring first (not in NCLT) – but you still have to treat the account as an NPA. If there’s no recovery, then NCLT will change ownership or liquidate. And if you’re not willing to pay, no matter whether you have or don’t have the ability, you lose the ownership anyhow. This means only one thing: no special treatment for anyone that genuinely wants to pay but cannot – they need to be able to pay at some point, beyond which they lose their company to the bankers. Recognition of Non-Performing Assets has meant deterioration and weakening of Balance Sheets. In this regard, he touched upon BASEL norms and how losses, Expected, Un-expected and Potential Losses are met. The picture below throws more light on the same. 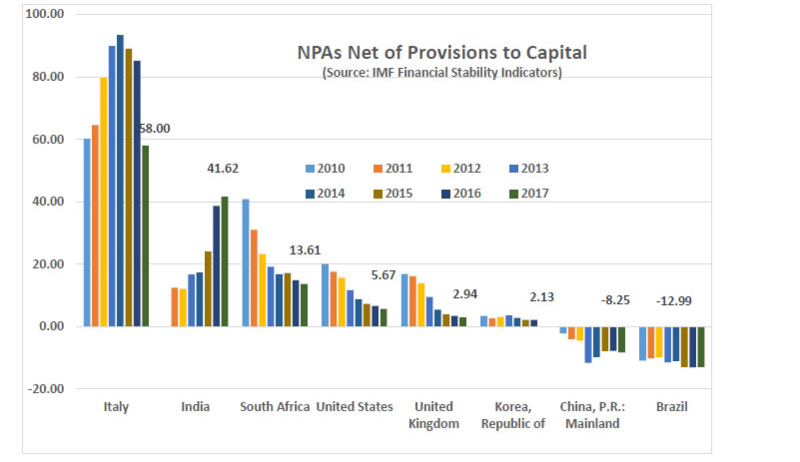 One of the most insightful and frightening charts is the one that plots multiple years of NPA’s as % of Capital and compares the same to other major countries. India is the only one that has been seeing a Rise in Net NPA’s as a percentage of capital that are un-provided for. Banks in China and Brazil on the other hand have for years allocated more capital than what their official NPA requires them. Simply put: Indian banks are not provisioning enough. How Much Capital Do We Have? And final chart that while shows how low Capital to Weighted Asset Ratio is. Means, for every rupee really lent out how much capital do banks have? Only two countries are below us – Bangladesh and Russia. 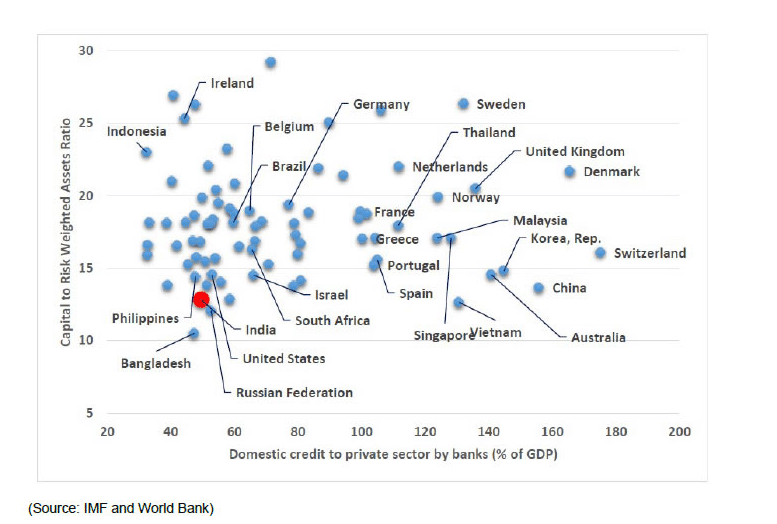 Most of the developed world had a much higher CRAR and much higher Domestic Credit as well. Our overall CRAR is low at 13% but so is our private credit to GDP (50% of GDP). And much of our “private” credit is to government owned entities so that changes things a little more. However, it means we are starved of capital and banks do need to raise much more. In comparison, most of the larger NBFCs are at 18%+ on the CRAR scale. While the speech is long, the conclusion is sharp and on the point. Provides a good framework from which one can analyse the Banking Sector as a whole. RBI releases a ton of data that can be easily accessed by the common investor. But data is just raw information, knowledge from understanding where and how to apply such data. That requires experience and wisdom that is generally beyond our capabilities. While we get economic commentary from Independent Economists whenever new data is released, the best analysis is always from those who are part of the system than being outside the system. The risk with Insider views is that they can be biased since they being policy setters wouldn’t agree with views that go against that very policy.